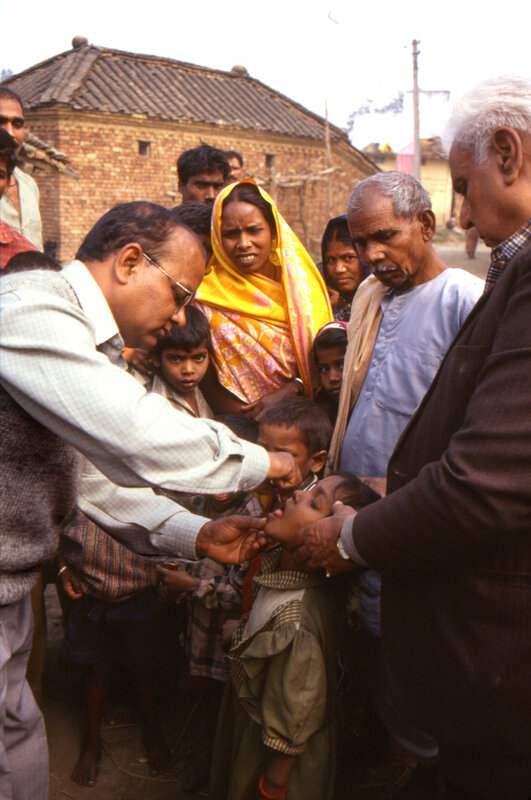 This 2000 photograph depicted a local Indian public health care practitioner administering an oral polio vaccine dosage to a child in an outside setting, in one of the country's many villages. After being vaccinated, one of the child's fingers would be marked with an ink marker designating to other health care workers that he'd been vaccinated during the National Immunization Day campaign. The image was provided by Chris Zahniser, B.S.N., R.N., M.P.H., a STOP team member and photographer, who was assigned to the state of Uttar Pradesh in northern India, and spent three months working in the Districts of Gorakhpur and Deoria. CDC/ Chris Zahniser, B.S.N., R.N., M.P.H.